Thanks to all the commenters and readers who emailed me. The winner of the random drawing for the Cartolina Notebooks is Rachael of Little Bites of Heaven. Congratulations Rachael! Blogging has been so much fun and I appreciate all the comments and reader emails. As you know, I'm a huge fan of the very talented Fiona Richards of Cartolina Cards and would love to share a complete set of her recent notebooks - 9 in all! - with a lucky reader of this blog. Just leave a comment by Saturday morning, 9 am e.s.t. If you don't have a google account and can't leave a comment - feel free to email me at mynottinghill (at) gmail.com with Cartolina in your subject header. These notebooks are also available online at Greet Q - and at $4 a piece they make the perfect treat for yourself or someone else. Also, Fiona has the most lovely blog full of visual treats and interesting things that are really unique - check it out at Cafe Cartolina. 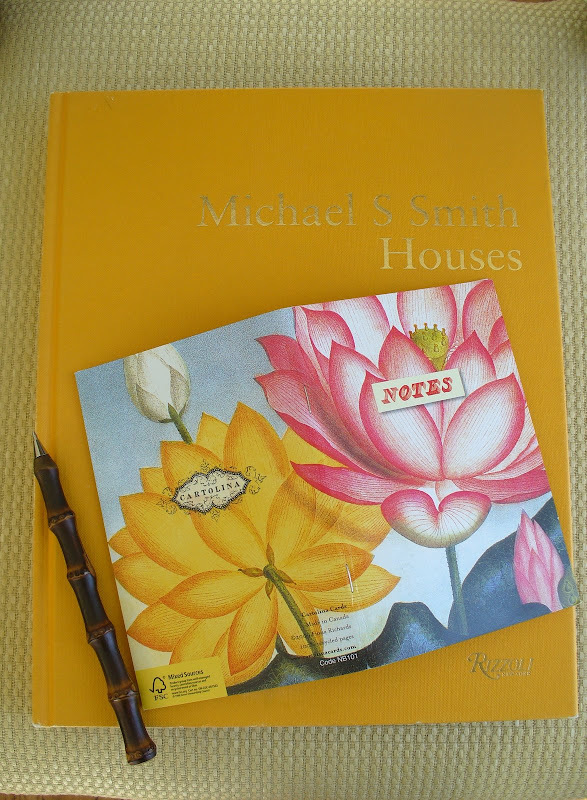 Here is one of my favorite notebooks spread out on Michael S. Smith's book without its cover.I love the colors contrasted here! I carry this notebook around with me and make notes and drawings in it too. Tomorrow I'm headed off to the Philadelphia Flower Show with a friend. I've never been and am quite excited - especially since Spring here in D.C. seems to be on temporary hold. Here' s the view out my family room window. I was bad - never brought the umbrella in for the winter! 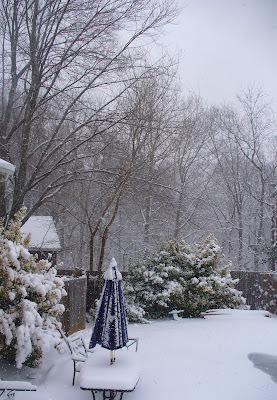 The snow is covering our pool cover - can't wait till that is gone and we can get out there and enjoy the backyard. My kids, however, had a great time building this the other day! The covers of those notebooks are gorgeous!! So bright and cheery...and they seem to have that lovely vintage feel to them. the notebooks are stunning. i was just looking for a new one the other day, but couldn't find any i was happy with. these would be perfect. i adore them. I love those notebooks. They would be great for doing my "morning pages" (from Julia Cameron's books) or a list of story ideas. Thanks for offering these to a lucky reader. I enjoy your blog all the time. Thank you! 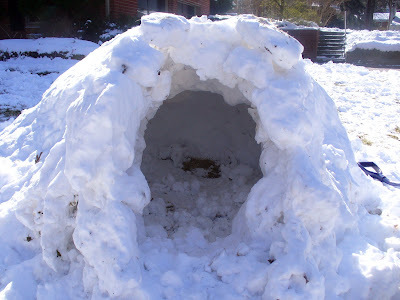 I love those notebooks, but I love your kids' snow fort even better. Too cute! What a great way to write a note, jot down a measurement or leave a comment. The flowers and images (Geisha girl) are wonderful! I went to the site...great imagery. I must scoop up some of these, great gifts for friends, family or Moi! Thanks for the info. Oh, count me in for the contest! They are lovely. Have fun at the flower show. I'm sure it will be amazing and you will leave feeling wonderful and ready for spring! Sweet notebooks that remind me of a summer day! Just right for jotting thoughts and lists. What a great giveaway! I love reading your blog. I find myself checking in everyday. How lovely! What a nice treat for one of your lucky readers. Brrr, it looks over your way! Those notebooks are so great! They remind me of these vintage fabrics I found in my grandmother's linen closet. Plus they are just colorful enough to make taking notes a little more pleasant! Would love to be included in the notebook give-a-way. Love those notebooks! Came across your blog on Cafe Cartolina's blog and now find myself checking in daily. Really enjoy your blog. Thanks! 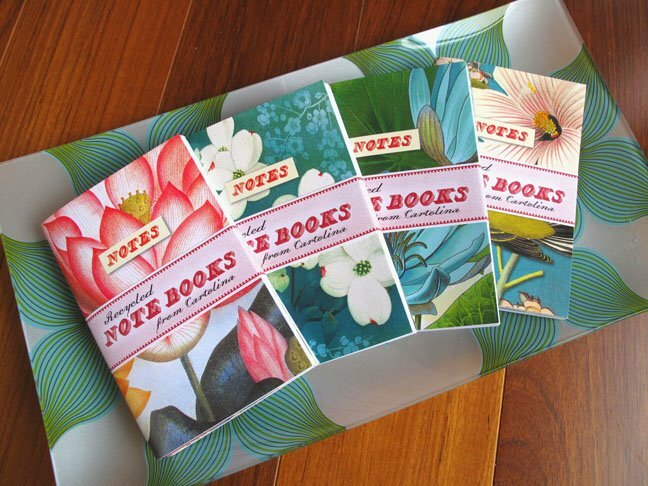 Oh, how positively pretty these notebooks are. If I won, you know I would give it a good home to many a note and a pve sketch! Love them and your snow garden looks lovely. Love the notebooks! They're a "flower show" all by themselves, aren't they? Really enjoy your blog too. Thanks! Those are gorgeous. I would love to win one. I love anything with a botanical print. A set of Cartolina notebooks would indeed be like hitting the motherlode. Divine. Have a lovely time in Philly -- I'd love to see the flower show this year. I've had Cartolina notebook envy for a while, thanks for having the contest! Hooray, I'm throwing my name in. ooooh!!! i adore these notebooks so much. what a generous giveaway!!! thanks! I would love to win this one. Love Cartolina Notebooks! I'm here from Fiona's blog- so happy to have another opportunity to win these gorgeous notebooks. Have fun at the flower show! What a fantastic giveaway! I'm a huge fan of Cartolina - such beautiful products. I love, love, love the red & white journal especially. These notebooks just make me happy!!! Spring is coming! Hooray! Love your blog and Cafe Cartolina. The notebooks are so awesome. Ooh, i like the background on which these beautiful notebooks were placed on! Very nice color coordination!!! I love flower shows.. Hope you have a blast! Loving these paper notebooks. They're perfect for a purse to always have on hand! Be sure to visit my GIVEAWAY too!! What a great giveaway! I just found your blog via Fiona, I love it! lovely lovely notebooks. good luck to me! I am a new blogger and I just discovered her marvelous blog -Its so inspiring! i just love these notebooks...what a fun surprise they'd be! These really are just beautiful. Carrying one (or nine) around with me would most certainly brighten up my day! I love these notebooks and Fiona's blog. She has a great eye for finding design inspiration. I love Fiona's blog. Her notebooks are so cheery too! So smitten with the notebooks — the colors and patterns are so great. Have fun at the flower show — I went a few years ago and loved it. The notebooks remind me of vintage barkcloth, a favorite of mine. Since my sister-in-law and I have such similar taste I know she would love them too. I confess if I receive them--I'm definitely sharing a few of them with her! I love this website and I love Cartolina! The combination is enough to make me weak in the knees. hop on over for a fab friday giveaway today! because of this wonderful giveaway, i discovered your great blog! Lovely designs in sumptuous colour palettes. Every design is equally beautiful, making it hard to choose a favourite! I have been following Fiona's work for months and these notebooks are by far my favorite! So unique but also practical! I try to carry a sketchbook with me everywhere for doodles and notetaking- wouldn't one of these be perfect!?!? These are beautiful. If it makes you feel better I never brought our umbrella in either, oops! de kids snow fort s even more cute too!! ha ha !! Those notebooks really are lovely. Thank you for the giveaway! Beautiful notebooks! artistic as well as useful...I like that. Your kids perhaps are budding architects themselves! Magical snow house! !